A beam of light was split between two diamonds, then recombined before heading toward an ultra-sensitive detector. By zapping diamonds with an enormous number of laser beam pulses, physics researchers have created several cases of what Einstein called "spooky action at a distance." A team of scientists showed that two diamonds can entangle with one another, meaning that vibrations in one of the crystals share an invisible, long-range connection with vibrations in the other crystal. "We have been able to demonstrate that even everyday objects can exhibit some of the strange, counterintuitive behavior of quantum physics," said University of Oxford professor Ian Walmsley, who led the study, published recently in the journal Science. Until now, scientists had only seen that phenomenon in frozen clusters of atoms. "One of the weird effects well-known from atomic-scale systems is the possibility of superposition - the ability of an object to be in two places at once," Walmsley said. You may have heard of Erwin Schrodinger's cat thought experiment in which a cat is both alive and dead at the same time because its life depends on an atom that has both decayed and not decayed. This paradox illustrates how bizarre superposition can be. In the case of Walmsley's study, photons were showing up in two spots at the same time and causing vibrations within a pair of diamonds. The researchers made it happen by placing two diamonds about 15 centimeters (about 6 inches) apart on a table and then shooting a series of photons at a device called a beam splitter. Most of them went toward one diamond or the other, but a few of the photons went both ways at the same time. When those multitasking photons struck the pair of diamonds, they caused vibrations called phonons with each of the crystals. The light from each of the beams recombines after exiting the crystals. And sometimes when the light is leaving the crystals, it has less energy than when it entered. That's how the researchers could tell that the photon had caused some vibrations. "We know that one diamond is vibrating, but we don't know which one," Walmsley said. "In fact, the universe doesn't know which diamond is vibrating - the diamonds are entangled, with one vibration shared between them, even though they are separated in space." Walmsley said that diamonds may someday be used to generate random numbers or store information in next-generation computers, but his colleagues point out that this particular research project does not have any immediate technological applications. It's just really fascinating, and really confusing, at the same time. The ring just arrived about a week after I orederd it. It is the perfect size for me perfect size diamonds and perfect size ring. I love it! It sparkles and shines and is just what I expected. There are some flaws in the black diamond that you can see on the inside of the stone but I don't mind because that makes it apparent that the stone is not an onyx or other dark stone. The holdings do not look completely sturdy so I will have to see how well it holds up to wear. But it is a beautiful ring. It is the best time to make some plans for the future and it's time to be happy. I have read this publish and if I may I desire to recommend you few fascinating things or tips. Maybe you can write next articles relating to this article. I wish to learn even more things about it! is that this your web site? We must always commerce links. Is it the case that the photon went both ways, which implies it entered BOTH diamonds, or did it just enter one diamonds as implied by the comment as to not knowing which of the diamonds was vibrated. Or did it pass through one diamond without vibratiing it and the other diamond and vibrating it. Also, couldn't you tell which diamond vibrated by putting a sensor immediately at the exit side of the diamond instead of waiting till the photon recombines? Also, I thought that if a photon interacts with something that it implies the wave function has collapsed in which case the photon wave will not travel through both diamonds. The fact that you don't know which diamond it passed through by NOT measuring which diamond it passed leads to the conclusion that you don't know which diamond vibrated. How mysterious! I hate to break it to you, but they are the physicists, not you. You are making generalized (as well as poorly thought-out and even more poorly worded) statements based on an article with nearly ALL of the technical specifics stripped out in order to dumb it down to the level of the mere "above average" portion of the population, rather than the brilliant portion who actually participate in the research and would fully understand (most of the time) the results. cant wait for my android wife. still deciding who to model it after. jessica alba in her prime or scarlet johansson. I've been recently intrigued by the theory of quantum mechanics, the idea (and I greatly summarize) that a particle can have multiple states at once. OK. This experiment seems more to be proving the beam splitters ability to truly split a photon equally to both diamonds wherein by both resonant at the same frequency. I mean the article says it itself, sometimes the split photons aren't exactly equal. So this experiment while neat doesn't seem to accurately demonstrate quantum mechanics in the least bit in my opinon, since I'm not a physicist. > I mean the article says it itself, sometimes the split photons aren’t exactly equal. I'm not sure where you are seeing this in the article. The beam splitter does not "split" the photons: if that were the case, the photons would be half in one atom, and half in the other. 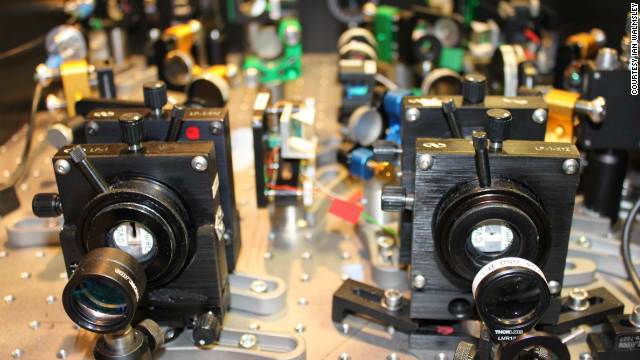 Instead, the beam splitter divides the laser beam–most of the photons go specifically to one diamond target or the other, but some are "superpositioned," and are simultaneously in both targets. II know it sounds like I'm being unnecessarily pedantic, but there is a difference between the two statements. You're right The photon hits both crystals at the same time. OK. I had to read that again. My quantum self is to blame. Even though quantum entaglement and wave superposition have been known, physicists have only known quantum behavior to exist at the quantum level...meaning, objects that are not much bigger than atoms or molecules. To find quantum entanglement in diamonds is fascinating. The search for quantum effects at macro scales will have many consequences for humanity...leading to better understanding and technological development. How is this anything new? We've known about particle/wave duality for about 90 years. You seem to have not understood the article. The new phenomenon was not quantum particle/wave duality; it was quantum effect at a scale never before seen. Something that had long been assumed impossible. Wow. This has to one of the absolute worst explainations of Schrodinger's cat that I have ever heard in my life. Not only is the explaination just wrong, but it's completely distorted the thought experiement. Schroedinger himself said that the whole "Cat in a Box" question was sarcasm. He was mocking the over-simplification of scientific matters by the physics community general. Indeed. I don't know why I bother reading "scientific" articles on CNN. They never fail to fail. I know for certain one absolute along our continuing path towards knowledge: "So far...."
Speech therapy experts are currently trying to find a way to "de-shriek" Sarah Palin's voice. It seems that most people would rather be locked in a room full of squeaky balloons than have to listen to her. If only! We couldn't possibly be fortunate enough for that to happen! And as bad as listening to her is, can you imagine Palin AND Bachman in the same room together? That could re-define cruel and unusual punishment! people are discussing serious physics. And how, in any way, does this pertain to the article? You are an impetuous troll, and incorrigibly stupid. Do the world a favor and kill yourself. Hari-kiri should suit your craving for attention, with it's theatrical (read: messy) nature. Good article. Those vibrations called phonons mentioned were particles of sound waves caused by the entangled photons in both diamonds. I sounds to me like it was the phonons that were entangled and not the diamonds. and the only reason the phonons exhibited entanglement was that they were being excited by entangles photons. They came up with a new way to verify entanglement. Well, Neils Bohr said that anyone who wasn't astounded by quantum mechanics didn't understand it. Richard Feynman said: "No one understands quantum mechanics." So most of us our in common company. I studied quantum mechanics for a number of years, I can write and explain the maths involved but that does not mean I undertand it. Feinmann might be the guy who's been closest to having a feeling for the matter and his conclusions are mind boggling. the person who wrote this page done a fine job! he got his point across, it was thougt inpossible! Mr negitve mike, get some backbone and rite your own page! Maybe this is what the crackpot was thinking of when he said the world would end. Whoops! Posted in the wrong place again – I'll just stick it here for people to rip apart. Good times. I think these results and some others that have been in other science news suggest that information has more of a dimensional energy aspect than anything else. So I have a partial quantum theory of gravity here but am lacking some things. With that said, I do not think that entanglement is limited to dimensional information/energy but also is an expression of the very wormholes we so often look for in theory, but what bothers me is that this is so similar to the slit-experiments done in the old days. If you really think you have some kind of new insight into physics then do what all other scientists do and submit your ideas in a technical paper to one of the leading physics journals for publication where it will be evaluated and potentially debunked by the all of the major players in the field. Don't bother posting it to CNN, where the average person has no idea. QST is just writing some Quantum Physics mumbo-jumbo. He probably just saw the re-run on Back to the Future movie on ION television. QST- photons do not have charge. also, they do not split in half; they have a probability of 1/2 of being in each of two places, which is not the same thing. the rest of your post rambles and I can't understand your line of reasoning. Thank you. I forgot that part. Sorry my post was not clearly written. Feel the vibe man, that is really what it is! For some reason, the posts on this article are far more amusing than usual! Hmm.. This could lead to instantaneous, noninterruptable and nonmonitorable communications. Imagine: a handheld device firing a modulated laser at one of these crystals, vibrating both it and it's entangled partner. These vibrations could be used to carry voice, text, or bits to a companion device. If entanglement works instantaneously rather than at lightspeed, this could make controlling Mars rovers easier too. Looks like 100% secure transmissions are possible – or will be one day. The entanglement is lost when measured. Information still is limited by the speed of light. The article says that the vibrations occurred when the same photon was split and hit both diamonds. That'll be tough to do if one diamond is on Earth and one on Mars. It's only a (relatively) short step from entangling the vibrations to entangling every atom in the crystals. Therein the information would be able to be transmitted instantaneously, regardless of distance. So you can cause Radiation! Scientist have found nothing with the LHC a 10 BILLION pound radiation vibration. is a total waste of money !? that is not gauranteed to find M*C squared (M*Common sense). I personally would have a fleet of Mercedes-Benz UFO6Trillion series out of the solar system collecting perfect diamons 6 inches in diameter among other Elements. It's a good thing that such a well-known and forward-thinking scientist like you isn't in charge of the program then, isn't it? You should be fuming that your ignorance is exposed so completely to the readers here. All experiments are valuable. Some we learn great things from and some we learn where a dead end is. Either way, I'm sure something can come from this. In the early 1800s, Britiish Chancellor of the Exchequer, William Gladstone, believed scientific research was folly that should not be funded by government. One day he met the chemist and physicist Michael Faraday who was experimenting with the new phenomenon known as electricity. Gladstone made disparaging and sarcastic remarks questioning how such esoterica could ever be useful. In the nascent stages of developing electric motors, Faraday confidently predicted to the future Prime Minister that he would soon be able to tax it. Imagine today's world without electricity. In my mind that world is not too much more advanced than the Stone Age. Of our modern lives, every aspect that is more advanced than that of a cave man came to be through some kind of tinkering or research. Those who have no curiosity benefit just as much everyone else, but they fail to see the ways in which research today will benefit their posterity. Frankly, they usually do not care whether future generations have a life that is better than ours. It is to our benefit that curious minded persons lived in generations past. We are the beneficiaries of so many scientists, explorers, inventors, and tinkerers. What good will research in quantum entanglement do us? It is impossible to say for certain, but if I could look forward in time I would not be surprised to see instantaneous communication: real time radio and 3D TV broadcasts when astronauts first land on Mars, no twenty minute wait for the signals to travel a couple of hundred million miles at mere light speed. Star Trek transporters and wormholes? We just don't know for sure what today's research will bring. I am quite confident of this however, it will make today's world look not much more advanced than the Stone Age. So, you're saying that the world of the 1800s was not too much more advanced than the Stone Age? Lay Off the video games. hate to use my brain on this one... but its seems like this "phenomenon" of entanglement is a product of human ignorance and the limitations of sensory perception... we know only what we see, and that is very little. Entanglement works on a different law of physics that would seem unnatural to us. However, I assure you that the laws of physics at work here says that it is perfectly okay for something to exist in multiple places at the same time. Hence the reason that a particle of light can vibrate two different things at the exact same time. The particle is allowed to exist in to different spots at the same time. Well put, One object can occupy two spaces, but Two objects can not occupy one space. The discovery of superposition was so brilliant because it is beyond our perception. Once you observe a particle, it's no longer in a superposition. Science and indirect observation overcome our limited perception. I believe this phenomenon was discovered through some sort of mathematics. Thus, human perception has little to do with the results of the experiment. That's exactly what I've been saying. They're out beyond the edge here. It's about the collapse of the probability wave function, Albert. It does not require humans to happen. Stop looking for your god here and go back to the "Belief Blog" okay? Without a requirement for human beings in the equation, your god is also not needed nor does he appear to have any interest in chatting with us via quantum means. Hmm? Good news: The violation of Bell's Inequality shows that information can move faster than the speed of light. Bad news: However, the only information that can move faster than the speed of light is meaningless information. Meaningful information is still stuck at the speed of light. There is no "meaningless information," and no, it can't move faster than light. Obviously you haven't been reading the comments here. The idea that we have "laws" of physics is incorrect. After repeated testing, we adopt scientific models. Einstein showed that Newton's model had flaws and we adopted a new model. Every so often we have a revolution of thought in science and have to adjust our models. Neutrinos and photons are two of many sub-atomic particles. We recently discovered that neutrinos travel slightly faster than photons (light). Einstein was wrong. He was, in fact, wrong about several things. Originally he believed there had to be a force that was an opposite corollary to gravity. Unable to find it, he recanted, calling the notion the greatest error of his life. Today we know that his original insight was correct: we call it dark energy. We don't know what it is or how it works, but we see it blowing the universe apart at an ever increasing rate. Neutrinos travel slightly faster than light. Quantum entanglement links matter at the sub-space level. Entangle particles then send them to opposite ends of the universe; manipulate one and the entangled particle experiences the same effect at the exact same time. How fast is that information traveling? It is traveling at infinite velocity, as though the distance between the particles is zero. That's as fast as it gets without traveling backwards in time to make the effect happen in the past, prior to the cause. Polymath, I would hypothesize that "Dark Energy" is simply the expansion of space-time without the proper formula for the gravity effects of EM energy being included in the relevant equations. Gravity is the dimensional distortion brought about by the reduced expansion of space-time. And, as I like to say, everything is dimensional energy. Also, without a proper determination of the other dimensions, we are likely to miss quite a bit in our math than not. Sort of an "argument from ignorance" which I usually hate to see people use, but if something doesn't fit in the proportion that Dark Energy theories tend to "not fit", then physicists are missing something rather fundamental in a key spot. Entanglement could even have an effect on gravity in terms of dimensional energy and what looks to be clear proof of wormholes, but I'm just knocking around ideas here. I'll check back if anyone wants to chime in. Polymath – Since when do neutrinos travel faster than the speed of light? There was a recent article here in the LightYears blog that an experiment in Europe _seemed to_ indicate that neutrinos in this experiment travelled at speeds slightly above the speed of light. However, a later article (also posted here) indicates that the results of the experiment were due to a measurement error–the scientists who did the original experiment dispute the claims of error. Frankly, I am not in agreement with the experiment (I, too, feel it was a measurement error), but for a while, there was indeed the suggestion that neutrinos might travel faster than the speed of light. We view and determine whether phenomena we observe fit into models, patterns, behaviors, "laws" and theories. It seems that the last frontier of our discovery will be in knowing the observer. We often to view our observations as being outside ourselves and our consciousness, and that these phenomena are independent and unaffected by the observer. If quantum physics has taught us anything, it is that the observer directly affects what is being observed and that entanglement applies to us as well. Physics, philosophy, and what is known for lack of a better word as spirituality, is beginning to merge. Hopefully the discovery of entanglement will teach us more than just a better way to encrypt credit card numbers. For more info on the quantum brain theory and consciousness read about Steven Hawking's mentor, Roger Penrose. Interesting assertion Capercorn... Einsteins' theory, in this case, is sort of like Schrodingers cat... dead or alive until proven existent! Hate to tell you folks, but this is a bunch of nonsense. Physics has gone downhill over the decades and now instead of discovery we have legerdemain. Hate to tell you, but you're a physicist like my dog is a brain surgeon. Maybe your dog could operate on his brain and fix what's wrong. Things haven't been right in physics since Newton. Why not go back to that then? I mean, you'd only have to give up a few modern conveniences–you know, like anything that directly or indirectly uses computers! I mean, who needs such crappy devices like transistors when they display quantum mechanical behavior? How erudite and incisive. Cal Tech is waiting for your call. Hang on everybody! Some physicist is going to figure out how to make a warp core with this set up and then we'll all be able to cruise through the galaxy at Warp Factor 6 some day! All of you Trekkers better get your Star Fleet uniforms cleaned and pressed! How was this fun project funded? First this project was done at Oxford university so its mostly funded by tuition. So please dont complain about tax payers money going towards science. second what is your point? Do you not see what benefits are possible from having full understanding of the universe? Science is how humans advance and benefit our race and im sorry you dont see that. The funding was generated by gay people on welfare who get pregnant so that they can sell their aborted fetuses to atheist scientists. Is that in the general neighborhood of the answer you wanted to hear? Ah, civil discourse... whither thou...? You forgot all the dark-skinned illegal aliens they hired. Ha Ha, Good one! Now Dinak can go grumpily back to watching Wheel of Fortune. I'm having gay thoughts again. Maybe dinak was just asking in order to get funding to further the work? Hmmm. How was it "funded", and I assume you mean WHO PAID for this study... By READING the article one gains the knowledge that the experiment was conducted at OXFORD, which happens to be in GREAT BRITAIN. So anyone with the IQ of a 4 slice toaster would be readily able to discern that it was EUROS or POUNDS that the BRITISH Citizens were taxed, to "fund" the study. I hope that eases you worried mind and allows you to sleep at night knowing that YOU did not contribute ONE CENT to what is an amazing discovery that occurred OUT OF THE USA, where most important discoveries are made in the 21st Century ever since the REPUBLICAN Administration of Bush & Cheney BROKE THE US ECONOMY & the middle class in an effort to appear to be a WAR POTUS to the degree his Daddy was or more. the photon hit both diamonds, ONE photon, simultaneously. If they could place diamonds within communication devices and send pulses of photons the capabilities of communication will become endless, what else, or who else, could we communicate with. Also this may help certain companies find more diamonds 😉 "I'm detecting some vibrations in South Africa"
Unfortunately, as far as is known and predicted, these entanglements apply to discrete, individual events, of which, each event does not have a correlation with the other events. Therefore, most discussion is that it is impossible to use the phenomena for communication. Richard Feynman has some excellent discussions on the subject. So, the existence of a quantum switch would not be possible ? So we would see a multiplicity of original information but where it cannot be changed or added / subtracted because that would violate the exclusion principle while also ignoring the multiplicity principle? If that's what you were getting at I hope I got that right. I'm working with limited resources here. Somebody tell me if I got it right. ? ? This doesn't work as a diamond detector. It requires both diamonds to be in the apparatus at the same time. Completely useless for finding more of them. So if you give women diamonds, you can get some to be entangled and go both ways? "...but his colleagues point out that this particular research project does not have any immediate technological applications." Apparently Billy here has already found one! Good job Billy! I nominate Billy for the Nobel prize! The real problem arises if you give the two diamonds to two separate women. Bringing them together will likely result in an energy release so intense that it would cause the electroweak Higgs field to collapse. So that is where that extra sparkle comes from in a diamond! I know that light travels faster than sound because the commentators in this blog appear bright until they open their mouths. You, sir, are a case in point. How can anyone on this blog "appear" to be anything at all, especially until after they speak? Maybe you're seeing things, hm? I have to admit though that his point about brightness made me smile a bit. Were they Diamonds from Tyffany. No, they went to Jerad's. I think you both need to go to spell check. I just want to know under what basis are they qualifying diamonds as "everyday objects". Everything else is crystal clear, but this dumbfounds me. Wut- Depends on which neighborhood you live in I guess! Diamonds are commonly used in industry. Diamond cutting blades and burrs are common. Scientists refer to "everyday objscts" as things you can touch, as opposed to say plasmas, electrons or black holes which you can't. Seriously, like Mr. Science said, "everyday" just means things you can lay your hands on. there's a big difference between what you see on TV in jewelry ads and the diamonds used in industry and research. Hah! Such a guy thing to say. Lulz. Not buying it. All this "uncertainty" gibberish is an artifact of relatively primitive equipment. When the tools catch up, we'll all laugh about how silly it was to talk about a proton – or a cat for that matter – going "both ways at the same time." >All this “uncertainty” gibberish is an artifact of relatively primitive equipment. We used to think that, but Heisenburg's principle is well established now. Yes, it is literally possible for certain particles to be in two places at once–well, to be more accurate, it is not only possible, but unavoidable, that the precise location of a quantum-scale object to be indeterminate if its speed can be precisely known. Albert, it has nothing to do with the equipment. Just measuring something that small has an impact. yeaaaa, except it was theorized almost a century ago and now we have some "primitive" equipment advanced enough to test the theory. IN FACT there has NEVER been ANY experiment that disproves ANY part of quantum theory...EVER. That isn't to say that it couldn't be disproved, but the odds are becoming increasingly slim, like winning the lottery 2 or 3 times slim. Don't argue with me until you do the research. The claim I made was actually made on a NOVA special last week or the week before, can't remember. So yea, educate! Apparently the uncertainty of two photons' being the same photon is zero. lol. I am certain you have something there. Nah, mark my words. Scientists always think they've got the actual facts until the next batch comes along and proves all their "demonstrated facts" were mostly cotton candy. Don't get me wrong; I'm a believer in science. But they're out beyond the edge of what's knowable here and don't have sense enough to quit playing with imaginary math and just admit they don't have the tools to do the job yet. Check back in a couple hundred years and you'll see. Hmm, maybe I am seeing wit where wit isn't, but is the combination of Albert's indignance towards uncertainty and his screen name a subtle nod toward and joke about Einstein's dislike of the uncertainty built into quantum physics? What with Einstein being known for his deterministic classical outlook. I am fairly certain that Einstein was rooting for the cat to be dead. Read up about the double slit experiment, Albert. Even when electrons were fired one at a time the interference pattern still appeared. The electron split in two, went through both slits, interfered with itself and then struck the detector. The pattern disappeared when a detector was placed in the slits to determine where the electrons were going. Educate yourself before mouthing off. Thanks in advance. and with that you give yourself away, lol. Unlike religion, one doesn't "believe" in science–if it can be proven in a physically demonstrable manner, it merely -is-. It's not up to us to choose whether or not it's true. You may be a "believer" in science, but your thinking is irrational. Yes, scientists have been wrong upon occasion, but it does not follow that because they have been wrong in some instances that they are always wrong. Also, you don't have a clue about the science involved in this. We're not talking string theory here, but rather repeatedly-supported hard science of long standing. I am familiar with the double slit experiment my condescending friend. We just don't have the correct tools to interpret this strange phenomenon, except for the common sense to know that to argue that something can be two places at once is to render meaningless the idea of "position." Science Geek is right, of course. Except that I think Schrodinger's cat might be dead, but that's because he feeds it a steady diet of theoretical food. Mine is OK because it gets Purina. lol, good joke, Albert! I think the problem is that positional information can be mulitplied as we see in this experiment. It isn't rendered meaningless if it is replicated, just redundant you might say, but that might not really be the best word to use either. I wish we had a better language to discuss these things. We do ....... its called math. I'm sorry to say that the math needed is not as widely used as the English language in talking about abstract concepts, thus I have no equations to show you beyond some scribblings and your math would give me headaches as I strained to translate them into visual concepts. I visualize a lot and never had a chance to learn much of the math, sorry. You'll understand this phenomenon more if you read "Quantum Enigma" by Rosenblum and Kuttner. Anyone can understand the book and it discusses this action at a distance and many other counter-intuitive results of quantum physics. Hah! I happen to be reading it right now. Fascinating and mind-blowing. Thanks for the recommendation. I can understand some of the concepts of quantum physics but popular-science books are always helpful. The implications are huge. The entire universe started from a single point and expanded to what it is today. The same principle applies. We just need to learn how to manipulate larger and larger molecules. We could visit other places without being there. Communications would be instantaneous. Speed of light is not the speed limit in the universe. It doesnt work that way. Yes, information is traveling faster than the speed of light according to some interpretations of this phenominon, but that information is inherently random. We could never use this to send information faster than the speed of light. The only way to extract any information from this would require measurements of both entangled particles. So basicly you could send an encripted message with this effect, but the encription key would have have to be sent by regular means afterward and the message would be unintelligible without it. There are so many things that we take for granted today that were also thought impossible a few decades ago. We may have some breakthrough that allows control over the Heisenberg principal. Some hellish spawn of a Stephen Hawking/Bill Gates type will come along and lead us into the next great renaissance. Actually, it doesn't matter how fast you send the message at all. Using a public/private key combination and some basic results of information theory, you can predetermine the key, and send the message after the keys have all been delivered. For example, entangle them first, and establish the keys. Then, when you transport the two entangled diamonds apart from one another, you bring the keys with them. carnation: You can try to be clever, but the universe and/or God still hate exploiters (will be fixed in universe 1.1). According to the delayed quantum eraser experiment that would just mean the universe would go back in time to erase the information. But only when you attempt to observe it, and force the superpositions to collapse into objective reality. Yes, the universe will go Terminator rules on you if you try to send information faster than the speed of light in a vacuum. On the other hand, if you just break the speed of light in a different medium such as water, sending all the meaningful information you want, the universe will reward you with pretty glowing colors. Or some Russian dude, anyway. Frangible, that's a new one on me. A "quantum" religious view. Wow. I gotta say it sounds very clever and so I give you one half of a quantum internet for that imaginative departure from science into the philosophy zone. For my part, I will only point out (and collapse your wave malfunction) that at the macro level there still remains no "entanglement" with anything resembling your "god" regardless of your desire that it exist. You come seeking quantum proof of your god and apparently do not realize that your superstltion never had any connection with reality in the first place as shown in daily life in the REAL world. There are no patterns suggesting a god-like being who changes anything in response to any experiment that I have ever heard of throughout known history. Take my advice: Enjoy the nice times with your fellow believers and try not to make bad times for anyone else. Is that not the law and the prophets? I like the idea of Santa Claus. I do not send letters to him because he does not exist in our modern world. I like Christmas music but would prefer to listen to it when I want and not have it forced on me like those annoying bell ringers do with their noise pollution. If you examine Santa too closely, he disappears as if one had focused through him to the other side. Keep your faith in a place where it does not become a problem. Don't be the nail that sticks up. I have a real hammer here. If you want to protect your faith, keep a sense of wonder handy and stop seeing threats to your Santa in people seeking truth and justice. Be a good person. Don't attack facts and don't examine your belief system if you want to keep your "faith". Give unto your secular requirements what belongs to your secular requirements. You don't have to be a gun. Physics just got infinitely difficult. Do we have students that can resolve the "new unknowns"? if an old geezer like me can come up with a partial theory of quantum gravity then I have no doubt there's a clever lad or lass out there with the imagination and problem-solving ability to take us all much further...but only if we don't all die in some idiot's version of a holy war first. Read Arthur C. Clarke: Rendezvous With Rama. In it he mentions data stored on crystals. Again showing he was a man ahead of his time. That whole series was phenomenal, the man literally described what some of our top scientists are theorizing today about what an interplanetary ship would have to be constructed like in order to support life long term. Information density has been bruited about since long before Clarke's story that borrowed on other ideas. He did not come up with that crystal idea I am fairly certain. Now THAT is a brilliant advertizing hook if I ever heard one!! And you just know the marketing geniuses at DeBeer's could pull it off; convincing people to spend an even more ridiculous amount of money for something like that. But were they blood diamonds? If that experiment can be repeated in some other independent studies, and if the results confirm the original reports, and if the experiment can be reproduced on a much larger scale (distances, energies etc. ), then it may be the first glimps of the 'instantaneous communication' of the scienc-fiction novels gone live. The 'quantum teleportation' comes next. Sounds crazy ? Yes. Too many 'if's'? Yes, indeed. But that is what is a real science about, and that is how civilization moves ahead. No divine revelations, no miracles, no witchcraft, just a hard and scrupulous work of thousands of experimenters that follows after bright theoretical ideas of great minds. Those who tell the basic research in sciences has to be banned due to the 'un-wise money spending' may as well drop all the technology, medical services, and entertainment and go to live in an old cave in some wild corner. Otherwise there is no way to avoid results of that 'un-wise money spending'. No, it can't be used for faster-than-light communication. Measuring one half of an entangled pair appears to have immediate consequences for what happens when you measure the other one (if "consequences" is the right word - there's a lot of disagreement on the philosophical interpretation) but it doesn't happen in a way that you control, so you can't use it to send a signal. Mike, if you measured one atom, could an observer of the other one tell that it was measured? Thinker...then if all you have is the ability to see if one photon was 'analyzed' or 'accessed', the number of analyses and/or frequency of analyses could be used to code a message...maybe? I was wondering if the energy from these vibrations could generate high speeds for interplanetary travel? probably not, but it does suggest that you wouldn't need to actually travel the way we think of it now; rather, we could interact from interstellar distances. Where the hell do you get interplanetary travel out of this. It's just diamonds vibrating. To an unbelievably small extent. If a bacterium landed on one of them it would vibrate more. He probably watched one of those shows that talks about the possibilities of using quantum information to both destroy and build matter from pure energy. That we don't have anything close to that in the works just makes it more fanciful sounding, but we can't build anything yet. We can't hardly destroy anything either. And if you could do one or the other you wouldn't need the other one quite so badly, I think, when looking for answers to human problems. So it sounds like the photon was what existed in two places causing both the diamonds to vibrate. So isn't this just confirming Young's double slit experiment? Either way it's still really cool. Keep at it and figure out how to use that for instant energy transfer over long distances. Then you could not only send long range communications instantly, but supplying power to something here on Earth, you could also supply power to a satalite in deep space instantly. Like Voyager 1 or something. >So isn't this just confirming Young's double slit experiment? No–Young's experiment confirmed that some forms of matter can act like both particles and waves, but had nothing to do with entanglement. > Keep at it and figure out how to use that for instant energy transfer over long distances. As much as I would love to agree, this isn't correct. First and foremost, the power comes in from the laser light, not from the vibrations. Secondly, the laser light must hit BOTH diamonds precisely and simultaneously (and that's a great deal harder to arrange than one might think). Thirdly, the energy of the vibration is not "transmitted" from one diamond to the other–the energy itself comes from the photons that are in both places at once. The energy of the vibration is "stolen" from the photon, which is why the exiting entangled photons are less energetic than the rest of the photons in the laser beam. One other thing that needs to be mentioned–the "entanglement" that the diamonds experience only lasts as long as it takes for the photon to pass through the diamond–a very brief time. It would be nice if this could be turned into instantaneous communication (and props to the people who are mentioning the "ansible" concept), but it doesn't work that way. I realize the way it works, and that the laser is what is causing the vibration (i.e. the laser is providing the power) but if you could get two diamonds to vibrate at the same time in two different locations, you could supply power to one diamond making the other vibrate and pull the energy of the vibration off of that one. I realize that this is very far off and may not even happen. I know the way this works, I've read enough about quantum entanglement to understand what's going on. But what they're trying to do with these types of experiments is figure out a way to tranfer energy long distances instantly. So i'm just saying keep at it. I think we were thinking about the same thing, You just did a better job of putting your thoughts into coherant sentences than I did. Ah! I see where you're coming from. Strictly speaking, that wasn't Young's work, but later variations on the same experiment (shooting electrons, or even C-60 "buckyballs", through the double-slit arrangement)–that's what caused the confusion on my part, as I tend to view the later variations as a separate experiment from Young's original work. Sorry for the confusion. > if you could get two diamonds to vibrate at the same time in two different locations, you could supply power to one diamond making the other vibrate and pull the energy of the vibration off of that one. Again–no. You would still have to have the same laser beam going through both diamonds–which, again, means that everything _on both ends of the experiment_ depends on the laser beam. That makes sense. There is nothing added but the slight energy of the vibrations is lost as quickly as it transitions in and out of affecting anything else. ? Shoot me or tell me how I'm doing here somebody. > There is nothing added but the slight energy of the vibrations is lost as quickly as it transitions in and out of affecting anything else. As far as I can tell, you've hit the nail on the head. The researchers have a long way to go and in their first step they seem to be confused as much as we the readers. It seems that the photons may have been entangled. Better yet light is a form of particles movnig at high spped beyond our congitive level that it seems to play trick on our level of observation. So they launched photons at a photon splitter. I did not know photons could be split. If they could measure the energy of each partial photon seperately, then they would know which dimond vibrated. They can't be split. The photon should go one way or another, but due to particle-wave duality (I think?) it can go both ways simultaneously. That's what they mean about superposition. Almost. Photon superposition is not the result of particle-wave duality, but yes, functionally speaking, the entangled photons are in two places at once. Are the two diamonds similar? Could the photons bounce back from one of the diamonds collide on the way back to the incoming photons and then deflect back to both the diamonds again (creating a simultaneous effect on both diamonds)? Next step–beaming objects from one place to another. This all makes complete sense once you recognize that space and time are illusions, and that the universe we perceive is just one of infinitely many. By definition, the universe includes everything, so you can't have multiple universes...unless you do cartoon physics and go to "infinity and beyond"
The terms "multiple universes" and "multiverse" are commonly used by physicists. The prefix "uni" can mean one or whole. It's not cartoon physics, just a readjustment in phrasing as a result of new data that suggests our universe, what we can see back to the cosmic background radiation and the Big Bang, is not everything that is out there. Looks like someone has never heard of the multiverse theory. Teletransportation is one application out of this entanglement experiment. A double vibration!!! What does it mean!!! What does it mean!!!! It means an application in battery operated adult toys. I wear white gold. always have. cotnrary to previous poster platinum is NOT any more durable than gold and does NOT require less maintenance. Scratches just as easily and has to be redipped to bulk it up after so much buffing just like gold. Platinum has become popular because of celebrities and because people think that if they buy white gold it will yellow over time since white gold is yellow gold dipped in chemicals. If you use a reptuable, quality jewler this will not happen. I have a white gold ring over 30 years old and it's still just as white as ever.Bridal sets are not tacky. They are just average wedding bands but have been molded to fit more snugly against an engagement ring for ladies who like to wear both but don't want the space and for some women it is easier to just pick them out at the same time. Most jewlers will be able to help you design and pick a wedding band based on any engagement ring you choose. As for whether you should get yellow or white gold, I think you should just go with whatever type is in most of your jewelry that you already own and wear most often. I think the problem comes in when you wear both types at the same time, otherwise it's just personal prefrence just like what color car you drive. Could this have application in instantaneous communication? I was thinking the same thing. can any one say mass effect2? And can anyone say "Ender's Game"? I'm afraid not. Quantum entanglement is still restricted to the speed of light. I don't think so. Sure the photons are moving at the speed of light but the entanglement is not moving at a speed, its an effect of a single photon existing in two places in time and space...or possible a distortion of Time-Space that we don't fully understand, but it isn't moving. With this technology you could transmit data instantly from anywhere in the universe. bye bye copper/fiber/wireless/bluetooth. cant wait till it becomes mainstream. Unfortunately that isn't the case. Although the two diamonds are entangled, you cannot transmit information faster than light using this method. Even if you moved the diamonds several light years apart, any measurements one team performed on their diamond would not be found to correlate with the other team until they had a chance to compare results, although both teams would have observed the same results at the same time. The key problem is that any measurement you take will appear to be random, so you cannot send information via this technique. You are forgetting that once you have a known distance you can caluclate the time the beam will travel from one diamond to another. Also sending a beam at vast distances would have to have huge computations to account for objects that could block, slow down, change the path of your beam(black hole). The data isn't transfered, It exits in two places. If you can get an object to exist in two places, then you can have instan communication accross light years. "Although the two diamonds are entangled, you cannot transmit information faster than light using this method." Just one more example of what kind of misinformation can get out when the people who write the article have no idea what they are writing about. It wasn't the diamonds that were entangled, it was photons. Use your reading skills and focus. The study's primary investigator himself was quoted as saying, "the universe doesn't know which diamond is vibrating – the diamonds are entangled." Pretty hard to read that any other way, hon. I do not feel you understand either the article above, or the metaphor of Indra's Pearls. This is not for proper forum to expound on the Pearl metaphor, but let it suffice to be said that no, you could NOT use pearls for the experiment. I would have flunked physics if Bristol Palin hadn't tutored me. Kind of like the 13 CRYSTAL SKULLS legend.